Captain Shackelford’s Company of Alabama Red Rovers is a Texas-based group of Texas Revolution Living Historians and Reenactors. The company’s membership is currently ranges from the Staked Plains of the Texas Panhandle to the South Texas Coastal Plains and everything that lies between. 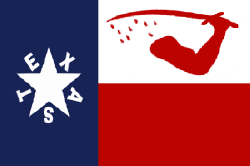 Most of the events we support are centered at Goliad, since that is where the Alabama Red Rovers originally were garrisoned and the fields that they fought for, We also support events at Gonzales, Washington on the Brazos, the Alamo, and San Jacinto. The first time in recent history of a Alabama Red Rover being represented at Crossroads of Texas Living History Association’s Annual Fannin Massacre Reenactment that is held in March was in 2005 when William Scott donned a red hunting frock and strapped a large knife to his hip. The impression had not been represented since the late Dan Casbeer, whose red hunting frock hung in the museum at Presidio LaBahia and is still in their collection. 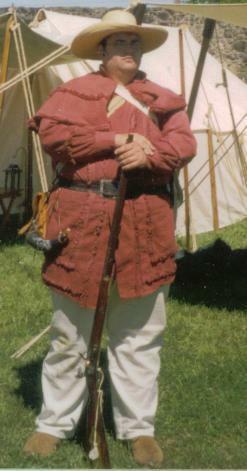 Within the next year Scott started laying the foundation for Captain Shackelford’s Company of Alabama Red Rovers, bringing in other like-minded living historians to the project and continuing to research the original company of Alabamians including research trips to Alabama, and walking on the same ground that those men left before fighting for Texas Independence. In 2006, was the first year that an Alabama Red Rovers “Company” was fielded on the Goliad plain in many years. That year 12 men answered the call to represent those Alabamians that came to aid in the Texan cause. Early on in the company’s history a cadet program was established for willing participants between 12 and 15 that want to participate in historical reeacting but are not of age to fire a musket or rifle. The cadet program, LaGrange Cadets, has been extremely successful in preparing these young people what happens when we are on the field and the importance of safety at all times. As time has passed, the company has gained a reputation group of historians that is always striving to research and interpret the true history of their impression. Periodically through the year Lee Hise brings out his collection of Flags of the Texas Revolution and Republic which is a great asset to the organization and always creates interest from the general public. In 2010 the company expanded in the representing some other impressions and time periods including: Six Flags of Texas Color Guard, Los Soldados de Presidio de San Saba. Los Soldados de Presidio de San Saba served on the Honor Guard for the 2011 Rededication of Presidio San Saba. Captain Shackelford’s Company of Alabama Red Rovers continues to quench its passion for reenacting and Texas history through portraying the most accurate impression of Alabama Red Rovers as possible.